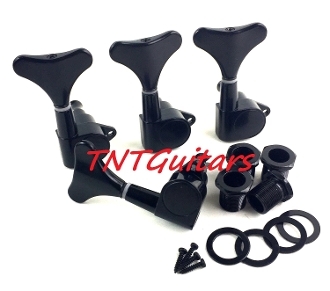 These Bass Tuners are enclosed-gear, threaded hex bushing, split shaft, modern sealed style guitar tuning keys for 4 String Jazz/J Bass, P/Precision Bass, or PJ/Precision Jazz Bass Guitars. These tuners use set screws for enhanced stability. Choose four right side in line tuners, four left side in line tuners, or 2 x 2 (2 right + 2 left) set as desired. We make it easy to add a single tuner to complete your set if you have a 5 String Bass. A single add on comes with 1 tuner, 1 bushing, 1 washer, and 1 screw. Be sure to check your measurements carefully to see if these tuning pegs will work for your set-up. If you have a right-handed bass, select right style in-line tuners. If you have a left-handed bass or reverse headstock, select left style in-line tuners. If you have a 2x2 set-up, select the 2x2 style. Contact us with any questions prior to purchase.